On the crop circle is presented a figure eight or infinity. Two circles of figure 8 form two individual cells (Fig. 1.1, Fig. 1.2, Fig. 1.3), brain areas of which are shown as dark circles in the center (Fig. 1.2). Internal decoration of 8 is made as chains composed of circles. These are also individual cells (Fig. 1.4). 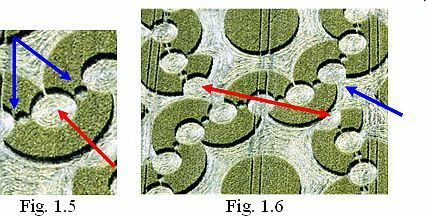 Near each small circle of the ornament on both sides are placed two small circles (Fig. 1.5). This is presentation of the principle of the united consciousness formation: unification of two individual cells with a small area of brain, form a cell of united consciousness with the extended brain area. In this case, a small circle (Fig. 1.5) depicts a cell unified consciousness, and two small circles on both sides of it represent individual cells. The opened image of cells as well as the broken off chain of the figure 8 (fig. 1.6), point that our civilization does not unite consciousness for the Transition in the following cycle of a life. Thus, on the threshold of global cataclysms humanity remains on life-dangerous level. 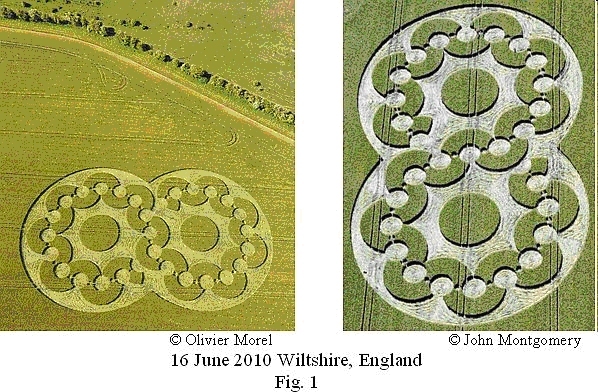 The crop circle with the same information was presented on 08.08.08 in the county Wiltshire, in England. The figure 8 shown in the pictogram presents two individual cells (Fig. 2), but ... without a brain area. Information cell is a representation of human being on the information level of the Universe. It contains a brain area and a body area (Fig. 1.1). Absence of brain area in individual cell indicates on destruction of mankind. On such sad result also point small figures-commas placed between large circles. Commas show outflow of information cells’ structure. ETC show us the salvation way from this critical situation – the unification of consciousness and the Transition to a new cycle of life. It means consciousness transfer from the fourth level to the fifth. This information is presented in the center of the picture.